Joel Scott is president of the Computer Control Corporation, headquartered in Connecticut. Since 1991, Computer Control Corporation has been focused on designing and installing high-quality CRM systems. Well known in the industry, Computer Control has garnered numerous industry awards for sales, training, and CRM best practices. Mr. Scott has authored several editions of GoldMine For Dummies and numerous articles and white papers on client retention systems. Mr. Scott can be reached by e-mail at joels@ccc24k.com. David Lee founded Vertical Marketing Inc. in 1983. He has more than thirty years of business experience in CRM and information systems industries. 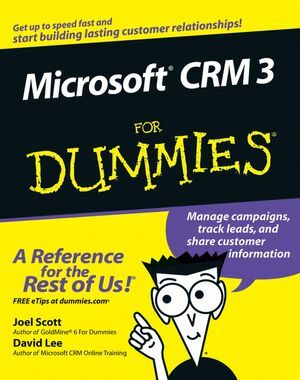 This is his first Dummies book, although he has written several white papers on CRM and the industry. He can be reached at dlee@vermar.com. Part I: Microsoft CRM Basics. Chapter 1: Taking a First Look at Microsoft CRM 3. Chapter 2: Navigating the Microsoft CRM System. Chapter 3: Using Microsoft CRM Online and Offline. Part II: Setting the Settings. Chapter 4: Personalizing Your System. Chapter 5: Understanding Security and Access Rights. Chapter 6: Managing Territories, Business Units, and Teams. Chapter 8: Implementing Rules and Workflow. Chapter 9: Creating and Using the Knowledge Base. Chapter 10: Setting Up the Product Catalog. Chapter 13: Working with Accounts and Contacts. Chapter 14: Managing Your Calendar. Chapter 15: Setting Sales Quotas and Generating Forecasts. Chapter 17: Handling Leads and Opportunities. Chapter 18: Generating Quotes, Orders, and Invoices. Chapter 19: Setting Up Your Sales Literature. Chapter 20: Using Notes and Attachments. Part IV: Making the Most of Marketing. Chapter 21: Targeting Accounts and Contacts. Part V: Taking Care of Your Customers. Chapter 23: Working with Cases. Chapter 25: Managing Your Subjects. Chapter 29: Ten Ways to Get Help.